When we adopted the twins, I was confident that love would set things right to their very wrong beginning. I grew up watching love heal wounds, reconcile conflicts and instill hope. So naturally, I counted on our love to do the same for the twins. We addressed their physical pain with frequent doctor visits, and we prayed that their emotional pain would go away with frequent hugs and a multitude of other expressions of our love. We anticipated that it would be slow work, but our family was ready for it; we longed to love. And since we were eager to give it, I thought that the twins, Jacob and Jessica, would be eager to receive it. That was true with Jacob; our love was like throwing him a lifeline—he grabbed hold of it with a strong grip. But Jessica’s reaction was different. For whatever reason, her pain seemed deeper. The scar tissue around her young heart had hardened and made it difficult for the love to sink in. It felt like she made a game out of our love, often deflecting it so it wouldn’t soak in. It was like water on a duck’s back. This part of our adoption story, the love intertwined with pain, is the area that surprised me most in our journey. I’ve shared this month that we’ve had lots of surprises–Adoption Awareness, and Who am I—but this surprise was the hardest. I anticipated that love would be a recurring theme throughout our adoption story. I didn’t anticipate that pain would stay right there with it. I thought that pain would be a small part of the introduction, quickly overshadowed by the powerful theme of love. But Jessica’s pain remained. At least her defenses did—which is the part we could see– and then it became difficult to distinguish between the two. The very defenses that she developed to keep new pain away also kept love at bay. And ironically, those defenses created new layers of pain. When she was almost a teenager we discovered research about this cycle–reactive attachment disorder. The new resources gave us lots of explanations and some tools, but they didn’t take away the pain either. To our surprise, her pain lingered. Not only did the pain linger, but her pain eventually became our pain. It caught me unaware because I thought that our love would take away the pain. I didn’t consider that loving her meant we would join her in the pain. I never imagined how complicated her wounded journey would be, nor did I expect to be wounded on the journey myself. Our natural instinct is to want pain to go away—our own pain and the pain of those we love. So we read lots of books, went to lots of therapy, and then went to more therapy. 1.Love doesn’t always take away the pain. Sometimes it does, but sometimes loving means joining others in their pain. Love does mean they don’t walk through the pain alone. It will likely hurt; love doesn’t always feel good. But I think this is God’s kind of love more than the idealistic love that I had when we began this journey. 2. We can’t measure love by how “effective” it is. Just because our journey didn’t take the path that I expected, it doesn’t mean that we didn’t love enough or love the right way. We constantly learn how to love better, but all along the way, we love. We love by staying on the journey, not by checking off results. 3.Love is stronger–and more difficult–than I thought. 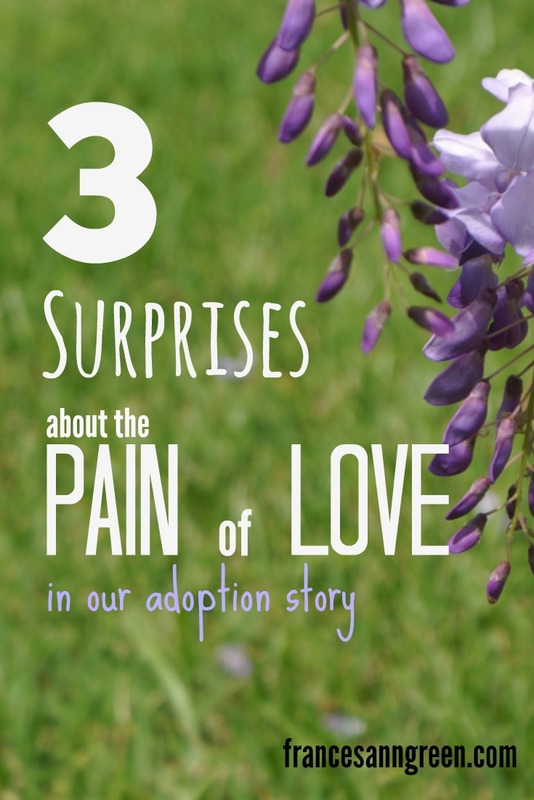 While the pain has been a surprise on our adoption journey, love has surprised me even more. Love is strong. It’s strength, though, isn’t always manifested by removing the pain. Sometimes it is strong by persevering amidst the pain. “It always protects, always trusts, always hopes, always perseveres.